Der Artikel Nik Bärtsch (geb. 1971): Stoa wurde in den Warenkorb gelegt. What is this music that throbs so relentlessly, as it dances in juxtapositions of odd and even meters? For all its dynamic attack, it is clearly not ‘jazz’. Although jazz is part of Swiss pianist and composer Nik Bärtsch’s background, and improvisation has a circumscribed role to play in his pieces, this is not ‘self-expression’ music. Some listeners at Bärtsch’s Zurich club concerts, and a handful of pop critics, have spoken of affinities with “trance” and “ambient” music, but there are no electronic “loops” deployed on “Stoa”. The Ronin band’s complex, iterative grooves are generated in real time (no overdubs) by musicians playing with a tightly-focused discipline, and a very determined, or stoical, grip on the concept of time-playing. More than this, where the drones of “trance” may put you uncritically to sleep, Bärtsch would sooner wake you up. Heightened attention and clarity are the goals. The music’s interlocking rhythms and modular, repetitive constructions will make more experienced listeners think of the pulsating patterns of ‘classic’ minimalism. Bärtsch is no stranger to the sound-world of Steve Reich, for instance, a composer ECM helped to introduce, and appreciates the way in which ostensibly ‘simple’ material is given time to develop in minimalism, but his own pieces for Ronin deal in rhythms and beats, rather than Reichian ‘pulses’. It is a significant difference. Where minimalism is often concerned with the illustrating and solving of a given musical problem, this is not enough for Nik Bärtsch, who enjoys the “physicality” of the band context, its organic meshing of textures. He says that Ronin plays “Zen-funk”, a label intended to be descriptive, provocative, and, well, Zen-paradoxical. He acknowledges the influence of both Eastern philosophy and James Brown’s earthy ostinatos and differentiated rhythm upon his musical thought. 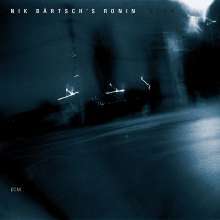 Prior to Nik Bärtsch’s overdue journey to Japan, he came into the orbit of ECM Records. Early in 2003, producer Manfred Eicher heard Bärtsch playing at the Wasserkirche in Zürich and, through the auspices of a mutual friend, arranged a meeting with the pianist at the Galerie Semina Rerum, where they exchanged ideas. A month later they met again to discuss plans for an album. Subsequently, in far away Kobe, Bärtsch worked on his compositions and reflected on the players best suited to record them. As his interest in composition developed, the desire to play live-jazz evaporated: “I just didn’t see the sense of it anymore, for me personally as an instrumentalist”. He played solo concerts and, in 1997, formed the acoustic group Mobile which “develops integral musical concepts within a ritualistic framework.” Their performances have often been marathons, incorporating multimedia elements, or held in unorthodox settings (such as a recent a six-hour concert on the Lake of Zurich). Most of the pieces on “Stoa” are through-composed, but there is also some improvisational freedom and interpretive leeway. The introduction to “Modul 36” with Björn Meyer’s bass and Bärtsch’s “overtone chords” was freely improvised, for instance. The pieces acquire new details in performance too: several sections of “36”, including the fast piano / bass clarinet unison lines, arrived as afterthoughts in this way and were arranged by Bärtsch and added to the piece. “Modul 35” is rigorously written, “like a classical piece that could realistically be given to another ensemble to play”, until the last “dark section” with the piano solo. “Manfred suggested leaving the high bell out of the final part which was a smart idea. It opened up some space, made the sound more magic and agile and less obviously structured. A little thing like this can change the whole energy.” Sha treats the melody quite freely in the “flowing section” of “Modul 32”, and the very percussive bass clarinet in “33” is also Sha’s innovative interpretation of the composed bass line. Quite frequently in concert, Ronin combines its ‘modules’, and this is what is happening in “Modul 38_17”, where an older construction is stacked on top of a new one. “Stoa” was recorded in Studios La Buissonne in Pernes-les-Fontaines, France, by Manfred Eicher with engineer Gérard De Haro, in May 2005, and will be baptised with a special release concert by Nik Bärtsch’s Ronin in Zurich’s Kaufleutensaal on March 10th 2006. The launch concert is followed by dates in March in Bern, Basel, Berlin, Memmingen, Munich, Lugano and Novara (May). For more details, consult the tour page.